2014 marks the year of the horse (also my Chinese zodiac sign), and I thought it would be fun to create something theme related using Chantecaille's Wild Horses palette (thank you, Justine :D). I wanted the Wild Horses palette when it was first released, then convinced myself that I didn't need it (I told myself, "self you have a trillion shades like that in your collection, you DON'T need it!"). But, that was short lived and now I bring you this post. 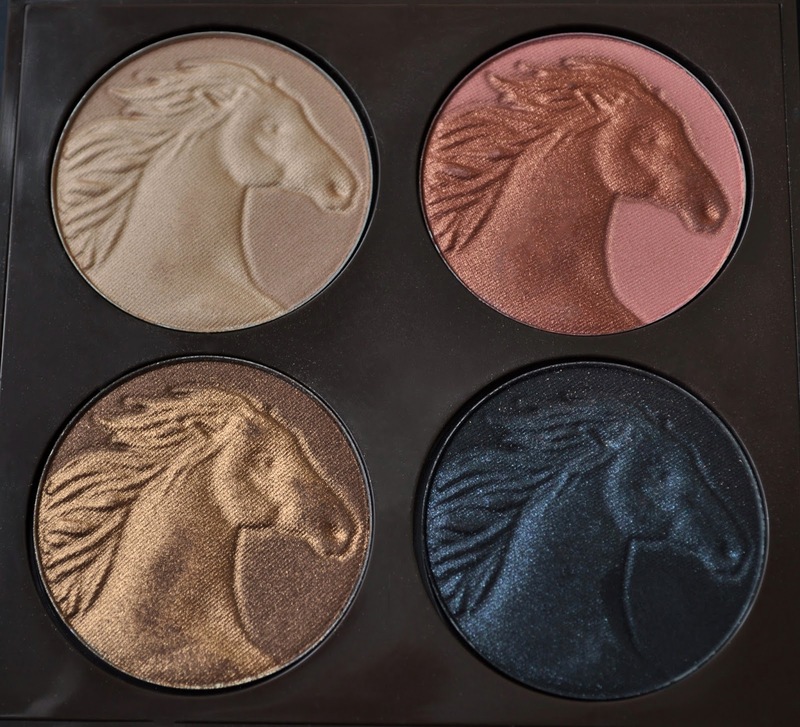 Wild horses is a beautiful palette! Yes, the shades are not monumentally original. However, as I say (and, mostly to Aki), "it's not only about the color, it's also about texture, finish, quality and performance," and Chantecaille is a brand that excels in all those departments. 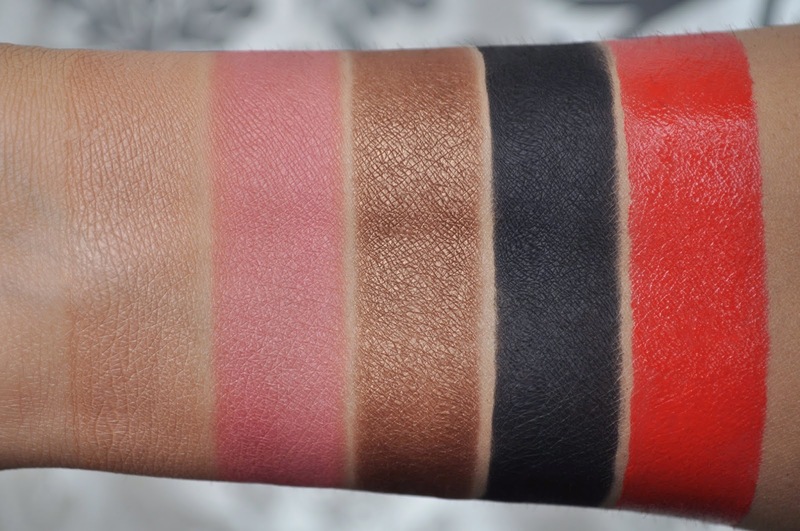 Wild Horses Palette (swatched without over-spray), Hydra Chic Lipstick Persimmon. Palomino: a creamy, beige-blonde, can be used as an eye shadow or highlighter. Freedom: a warm, yellow-based pink. My only issue with the palette was the over-spray on the blush, I LOVE it! When mixed together, I adored the stunning russet sheen it gave my cheeks. 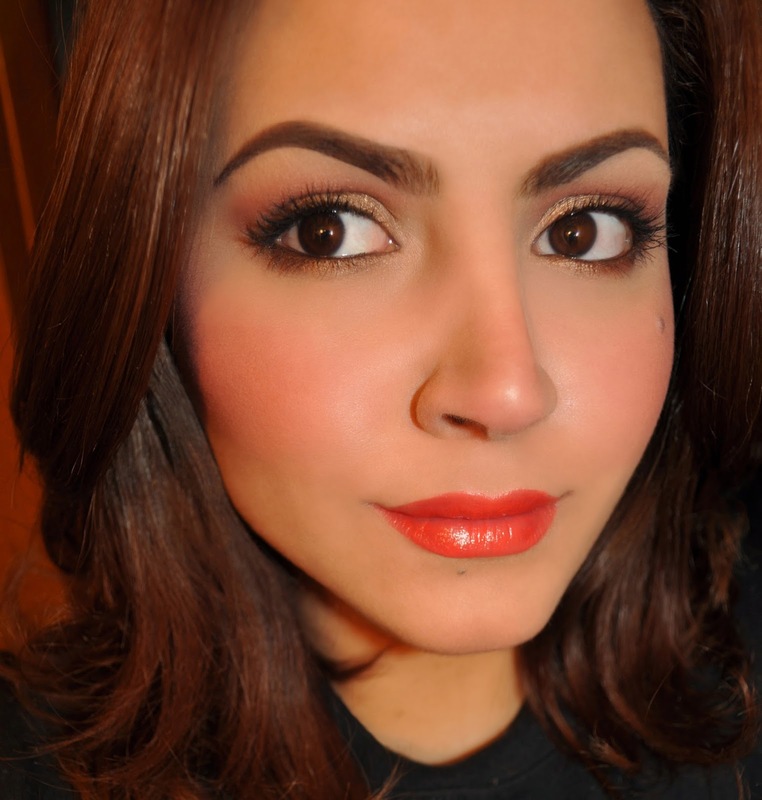 I didn't want it to go away, but was able to replicate it by layering the blush over a shimmery reddish-bronzer. Look beautiful on the eyes or cheeks. Mustang: a soft, chestnut-bronze. Besides the eyes, look amazing on top of blushers. Black Stallion: a rich black with a hint of midnight blue, can be used as a eye shadow or liner. 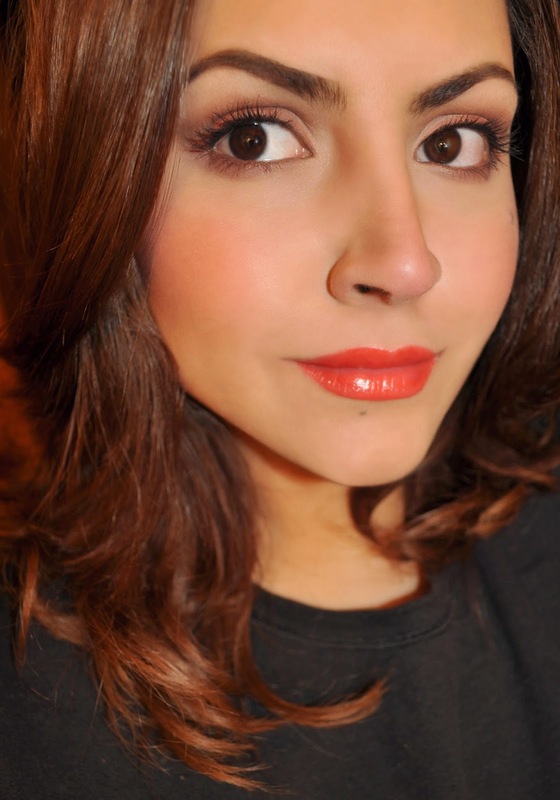 And another Chantecaille love, the Hydra Chic Lipstick in Persimmon. A vibrant, hydrating, glossy, Juicy persimmon color that leans a bit on the red side, but not too much. Rainy days = angry frizzy hair! Hourglass Ambient Lighting Palette (all three colors mixed together and placed on the center of the face). Laura Mercier Translucent Loose Setting Powder (all over the face). Freedom (on the apples of the cheeks and blended into the bronzer). Addiction Pressed Duo Eyebrow in 01 Cinnamon Duo. MAC Paint Pot in Utterly Becoming (applied all over the lid). Palomino (all over the lid up to the brow bone and inner corner). Freedom (on the upper lashline). Black stallion (pressed closely to the upper lashes). Black stallion and Freedom (mixed together and blended on the lower lashline). Urban Decay 24/7 Glide-on Eye Pencil in Zero (tightline). Chantecaille Hydra Chic Lipstick in Persimmon. Mustang (all over the lid and lower lashline). Palomino (on the brow bone and inner corner). Black stallion (blended from the outer corner to three-fourths of the upper lashline and one-third of the lower lashline over mustang). Urban Decay 24/7 Glide-on Eye Pencil in Zero (tightline and on the waterline). 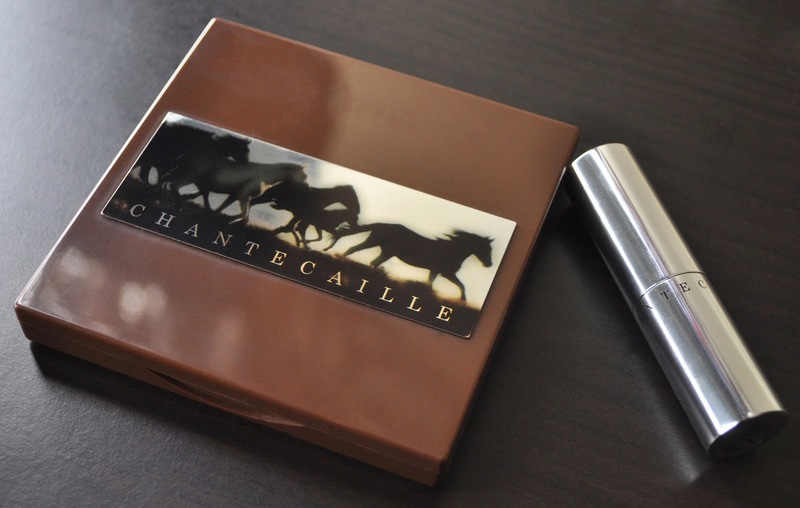 Did you pick up Chantecaille's Wild Horses Palette or the Hydra Chic Lipstick in Persimmon? Chantecaille always has the most amazing palettes, the turtle one is one of my favorites! Beautiful colors and so pretty you don't even want to use them! Also, could you be any more beautiful?? You're hubby is one lucky guy! This palette is pure magic on the lids. You won't be disappointed!